The seven Boblins are (left to right) Gully (style 40608), Bodkin (style 40634), Pi (style 40609), Onny (style 40633), Ruddle (style 40610), Pinny (style 40632) and Yam-Yam (style 40611). 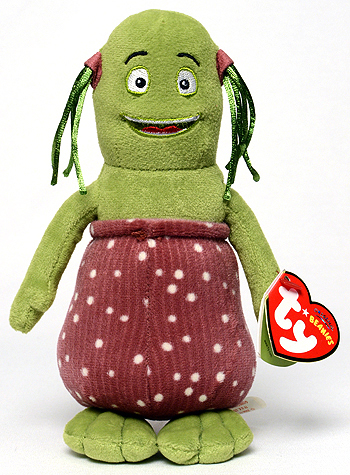 Gimmy a Sweden and UK exclusive is identical to Gully in appearance. They both have the same style number but besides the name, there are differences between their tush tags. Gully (left) and Gimmy tush tag back comparison. Gully (left) and Gimmy tush tag front comparison. 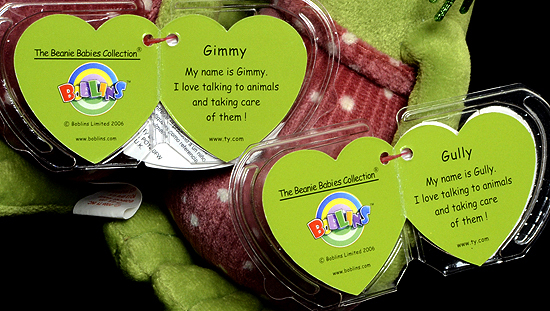 Gimmy (left) and Gully swing tag (inside) comparison.